The Geomorphology, Hydrodynamics, and Inlet Stability of Elkhorn Slough | Sea Engineering, Inc.
Map of Elkhorn Slough Using Multi-Beam Bathymetry and Lidar Topography Including Geologic Information. In 2005 SEI evaluated past research relating to the erosion problems in Elkhorn Slough including the geology and substrate conditions; sedimentary erosion and deposition; and tidal prism and tidal current velocities. 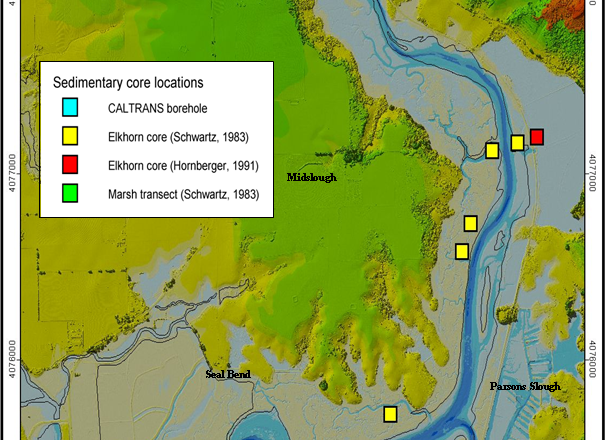 In addition, the study investigated new geologic data and numerically modeled the inlet stabilities of both Elkhorn and Parsons Slough‟s as they have evolved over time. The analysis of the relevant scientific literature applied with new geologic information and inlet stability modeling indicates that Elkhorn Slough may have a positive feedback system of erosion. Extensive erosion is expected to continue unless a solution to manage tidal flow is established within the Elkhorn Slough system.